If you agree that the use of the wild animals in entertainment is wrong, make sure your voice is heard. You can have your say by speaking out when legislation and laws affecting animals is under review. What factors and characteristics should determine if a type of animal is suitable for public contact? When the Animal and Plant Health Inspection Service (APHIS) describes an animal as dangerous, there are certain characteristics we use to classify the animals, such as the size, strength, and instinctual behavior of an animal, risk of disease transmission between animals and humans (i.e., zoonoses such as Herpes B), and ability to safely and humanely handle (or control) the animal in all situations. What animals should APHIS consider including under the definition of dangerous animals? For example, are all nonhuman primates dangerous? We currently identify some animals as dangerous, including, but not limited to, nondomestic felids (such as lions, tigers, jaguars, mountain lions, cheetahs, and any hybrids thereof), wolves, bears, certain nonhuman primates (such as gorillas, chimps, and macaques), elephants, hippopotamuses, rhinoceroses, moose, bison, camels, and common animals known to carry rabies. What animals may pose a public health risk and why? What risks does public contact with dangerous animals present to the individual animal and the species and why? What are the best methods of permanent, usable animal identification for dangerous animals? What are the most humane training techniques to use with dangerous animals? What scientific information (peer- reviewed journals preferred) is available that identifies the appropriate weaning ages for nondomestic felids, bears, elephants, wolves, nonhuman primates, and other dangerous animals? What industry, organizational, or governmental standards have been published for the handling and care of dangerous animals? What constitutes sufficient barriers for enclosures around dangerous animals to keep members of the public away from the animals? What methods (structures, distance, attendants, etc.) are needed to prevent entry of the public into an enclosure and keep the animal safe while still allowing for meaningful viewing? The USDA will also hold “listening sessions” where pre-registered speakers will have 3 minutes to address these questions (and the issue generally). No public human contact with wild animals is ever suitable, safe, or humane. 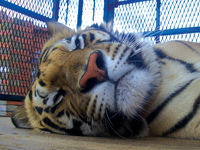 Wild animals - including big cats, bears, and nonhuman primates - are not toys, but are independent beings who deserve and are meant to live free; keeping them captive for our “entertainment” not only deprives them of the normal social, physical, and mental stimulation they would otherwise enjoy in the wild, it is also unethical. As modern society has come to learn more about other species, such practices are increasingly opposed as no longer acceptable. Please support this important measure to protect animals and humans.